I am having a great time in Portland. 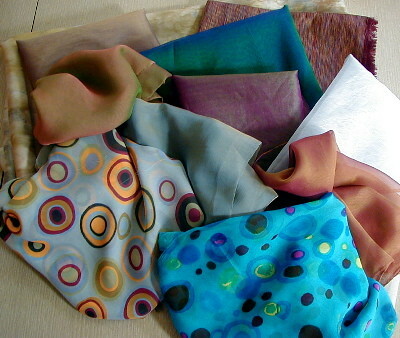 This morning Steph and I went to Fabric Depot where I found lucious silk fabrics to fuse. Here is a photo. It is Stephanie’s birthday. Jack made pancakes and bacon for breakfast which I almost missed because I was sleeping so soundly. To see some photos of the day go here. This afternoon Mia, Milo and I made carrot cake cupcakes which we are going to decorate like little chicks a la Martha Stewart because Stephanie loves chickens!! 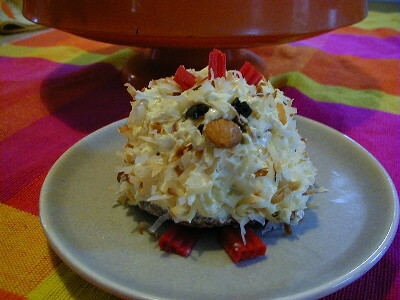 Here is a pic of one! Tonight we are going out for sushi. Tomorrow, I’m taking Steph shopping to get a watch and new shoes from me. We live in the heart of the California Wine Country- we could walk to a winery – and that is good cause I love wine. I especially love Sauvingnon Blanc that is dry, crisp and citrusy. I found a great one this week-end and also had an old standby. They both presented me with a new surprise – green corks! I love green – especially lime green. Aren’t these beautiful? 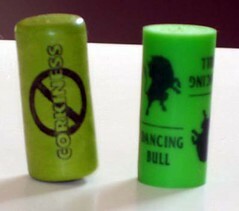 The lime green is from the Mason winery and the other is Dancing Bull. Here are two more postcards that I just made. I quite like them! I’m leaving on a jet plane in the morning. I am going to spend a few days with Milo and Mia and celebrate their Mom’s birthday. I love Portland. It is such a livable city. Great public transportation and neighborhoods. They live in the Mt. Tabor ‘hood near Hawthorne, which has lots of great shops and restaurants. I’ll take my camera and try to post from there. The Ordinary Season Banner is done!! This banner was done for a Quiltart challenge – The Straight and Narrow. The length had to be at least 5 times the width. This is 18 inches wide and 93 inches long. I made it as a banner for my church during the green season. I did a fused gradation of silks. The crosses in many colors represent the inclusiveness and diversity of our parish. Here are two close ups. Steve: I see that you have cut squares of fabric and “glued them down”. Me: It is called fusing. Steve: Well, you are not sewing them together. Me: This is more painterly. If I sewed them, they would all be the same size and it would look like a quilt. This is why I prefer to call myself a fiber artist and not a quilt artist. 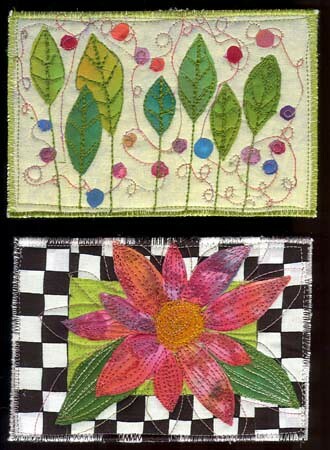 Sue Benner says that now that she has had fused quilts in Quilt National at least two times, it must be ok to fuse a quilt. Steve: Are you going to do any stitching on it? Me: Of course, I will stitch around the edges to make sure they are secure and do some decorative stitching on the crosses. End of the conversation with the nuclear physicist whom I love anyway. Here is the banner – all fused and stitched around the squares. Just have to stitch the crosses and zigzag the edges. Whew! I might make the deadline. I put it on the floor and stood on a chair in the hallway so the lighting is not very good. 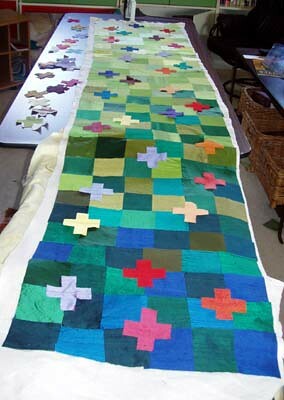 I have the silk squares fused and have started placing the rainbow of crosses. However, I think I need to quilt the squares before I fuse the crosses so that will be my next step – fuse the backing and start some simple quilting.